What MOOCs Don’t Want You To Know: Find out here! Who wouldn’t want to take a free college course from Harvard, or MIT, or Stanford? But these courses, called Massive Open Online Courses (MOOCs), are not all that they seem. On average, 90% of students who start a MOOC drop it. And most MOOCs don’t offer college credit. This guide will help you cut through the hype and decide for yourself if a MOOC makes sense for you. But what’s inside can keep you from wasting your valuable time! 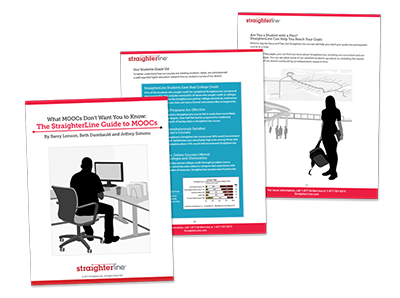 You can now download and enjoy The StraighterLine Guide to MOOCs.